There was only one man laying down 32-lap runs in the Stock Touring 13.5 class and that man was Jan Ratheisky. This would go on to earn him the over all win and would sit out the A3 final leaving the rest of the field to battle for the final two podium spots. The point’s battle was leaving it between Masaki Kiyoi, Henrik Heitsch and Tom Krageski. After the first two finals, the rest of the podium was undecided and it would all come down to the A3 final. Kiyoi and Heitsch would break away early from the pack and stayed close through the duration of the race. As the clock ticked down to the final seconds, it would be Heitsch who would take the win and the overall second. Kiyoi would take the third podium spot. With Modified Touring like speeds, the action was fast when the Super Stock 13.5 class took to the track. The battle in this class was between Takuma Sasaki and Jan Ratheisky. By the time the A3 final rolled around, both racers had one win under their belt and it would all come down to the A3 final and of course they’re going to make it close racing, otherwise it wouldn’t be exciting. At the end tone, Sasaki would edge out Ratheisky by one second to take the overall win. Perhaps the big story in this class was 7th qualifier Tom Krageski scoring big points during his finals to take third on the podium. The Front Wheel Drive class is here to stay for the duration of the AOC 2019 season and many people don’t mind that one bit. The thrills and excitement from this class had the crowd screaming and cheering during the final events. 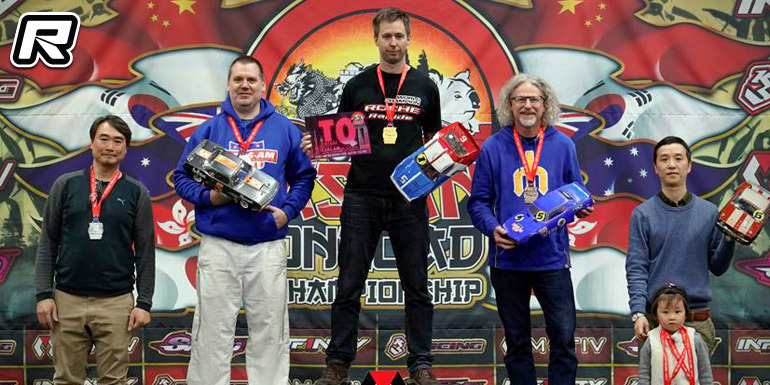 The freight train of FWD cars was lead by Top Qualifier Jan Ratheisky leading the charge. Ratheisky had a rear view mirror full of Sandro Speck and John Lu riding his bumper. 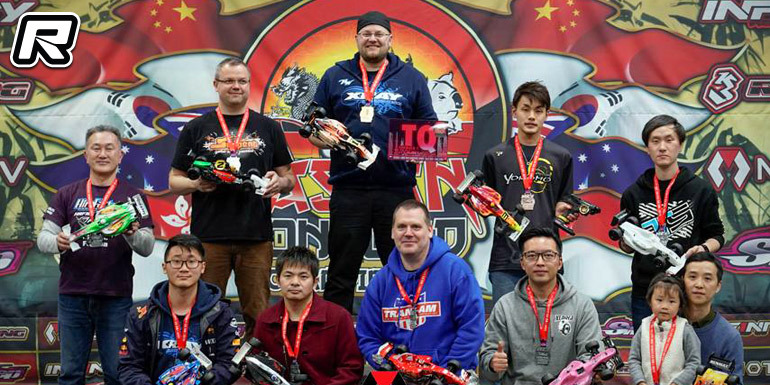 With less than a couple of seconds separating this group at times, Ratheisky narrowly edged out his rivals in the first two finals to take the overall win. If you had to choose the most fun class to race, it was perhaps the Vintage Trans Am class. There was probably more laughing and talking smack happening on the driver’s stand than there was actual racing. The racing that was going on, Martin Skarin was looking like the favorite to win staying at the front of the pack, or at least with in striking distance. It could have easily been anyone’s race to win and after three finals, Skarin would gather enough points to take the over all win. RCIv2 local Bob Peterson would finish in the overall second position with Patrick Morehead taking third. 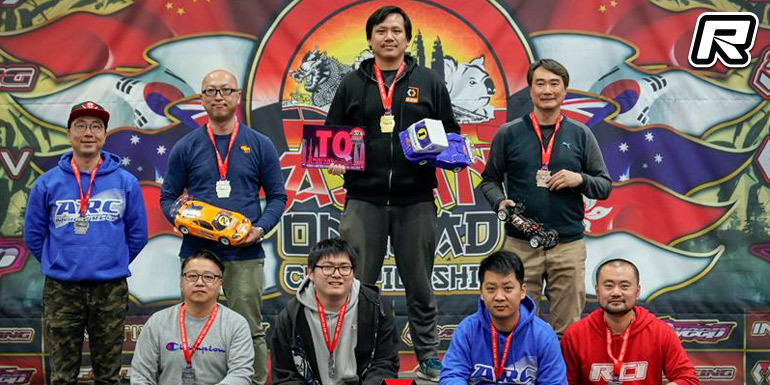 Al Luo was dominating in a big way in the Mini 4WD class. He set the standard high on what an excellent run should be, that it left the rest of the field playing catch up. Luo’s fastest run of the day came in the A1 final when he laid down an unprecedented 28 lap run with Xiao Ping being the closest racer to him two laps behind. 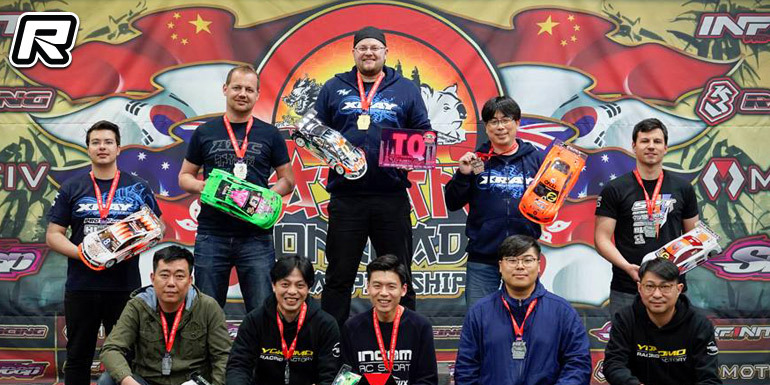 Things got a bit closer in the A2 final with Luo and Ping finishing on the same lap, but with Luo taking the win again, it seal the deal for him capturing the overall win. Jan Ratheisky is a regular at AOC events and he is usually on pace to finish on a podium spot, if not the overall win. Not if second qualifier David Ehrbar had anything to say about this. The pair swapped positions more times that one could count during qualifying and this fierce battle carried on into the main events. 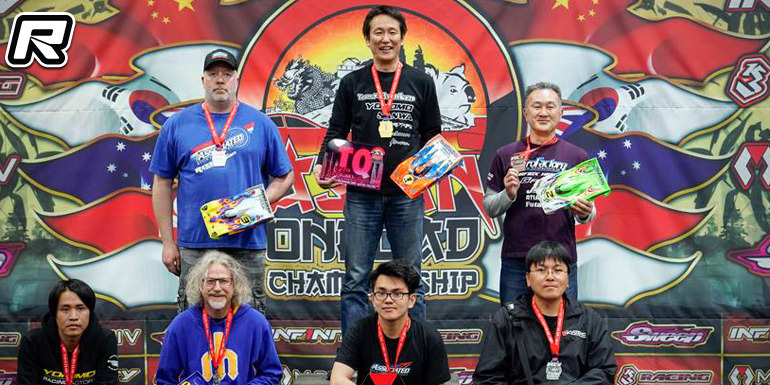 Ratheisky struck first in the A1 taking the win a full lap over Ehrbar, who himself narrowly edged out Toshi Yanagisawa by 3-tenths of a second. In the A2 main, Ratheisky had a bit of bad luck with a back marker, which unfortunately knocked him out of the run allowing Ehrbar to take the win, once again edging out Yanagisawa, this time by three seconds. Undeterred and determined to finish on top, Ratheisky put his head down and went to work executing one of his fastest runs of the weekend to take the overall win. The Yanagisawa brothers are best friends off the track, but on the track they hold nothing back, it’s take the win with no regrets. 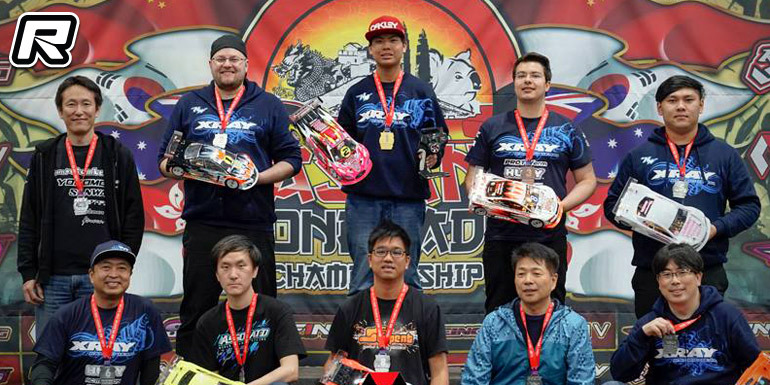 In 1/12th Modified, both brothers push each other to go faster and this weekend, luck was shining on Yoshi Yanagisawa. 8.4-second lap times seem fast on a results sheet, but when you see them in person, Yoshi’s car was easily the fastest car of the weekend and he showed it taking the first two wins, sitting out the A3 main. Brother Toshi would finish in the overall second with Walter Henderson finishing third. The 1/12 Scale Stock final had a few players laying down hot runs throughout the weekend, which kept everyone guessing who would take the over all win. 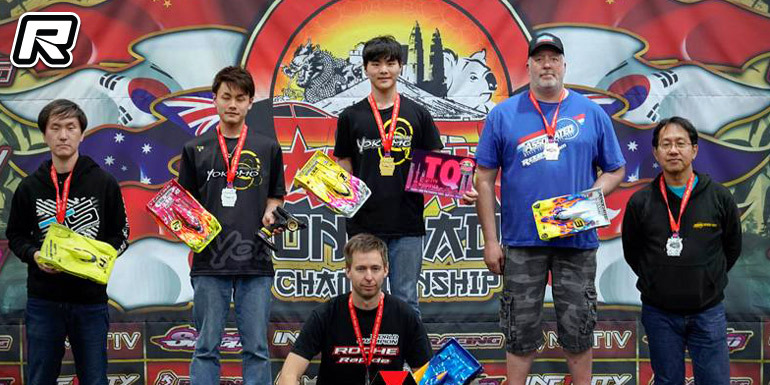 Top qualifier Takashi Kato showed some talented driving which rightly earned him the top spot. Taking full advantage of the front spot, Kato was able to pull away early in the first A-Main not looking back leaving second qualifier Hiro Nakatani and 3rd qualifier Walter Henderson dealing with traffic while battling for a podium position. Kato scored the first win. In the second main, It would be Kato and Henderson checking out in a heated battle for the lead. At the end tone, Kato would get some breathing room from Henderson finishing nine seconds ahead to take the top spot again and the over all win. 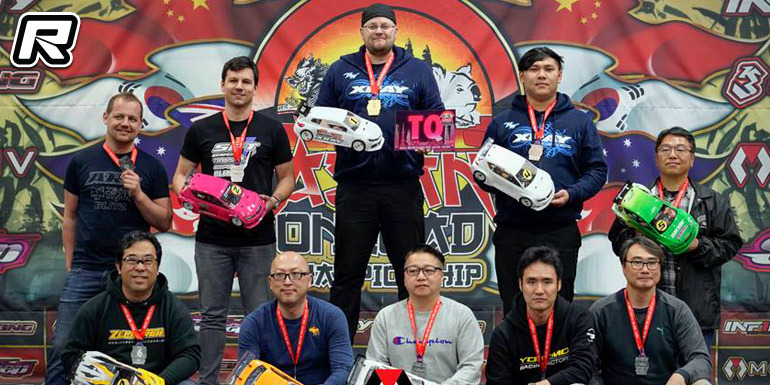 The post Asian Onroad Championship Rd1 – Report appeared first on Red RC - RC Car News.